Kalamazoo MI, February 8, 2018 - The Kalamazoo Symphony Orchestra with guest conductor and Music Director Candidate, Andrew Grams, present an intimate program of masterworks from the First Viennese School (Mozart, Haydn, and Beethoven). The orchestra opens with Mozart’s Magic Flute Overture. Pablo Ferrández-Castro, an international rising star, performs Haydn’s Cello Concerto No. 1 in C Major. Maestro Grams concludes the program with Beethoven's exhilarating Symphony No. 7. With a unique combination of intensity, enthusiasm and technical clarity, American conductor Andrew Grams has steadily built a reputation for his dynamic concerts and long-term orchestra building. Grams has led orchestras throughout the United States including The Philadelphia Orchestra, Chicago Symphony, Detroit Symphony, National Symphony Orchestra, St. Louis Symphony, Cincinnati Symphony, Baltimore Symphony Orchestra, The Dallas Symphony, and the Houston Symphony. He served as Assistant Conductor of The Cleveland Orchestra from 2004-2007 where he worked under the guidance of Franz Welser-Möst, and has since returned for several engagements. Maestro Grams has worked extensively with orchestras abroad, including the Toronto Symphony Orchestra, Montreal Symphony Orchestra, Vancouver Symphony Orchestra, National Arts Centre Orchestra Ottawa, Orchestre National de France, Orchestre National de Lyon, Orchester der Beethovenhalle Bonn, BBC Symphony Orchestra London, BBC Scottish Symphony Orchestra, Royal Scottish National Orchestra, City of Birmingham Symphony Orchestra, BBC National Orchestra of Wales, Sydney Symphony, Melbourne and Adelaide Symphony Orchestras, New Zealand Symphony Orchestra, Orchestra dell’Accademia di Santa Cecillia, Netherlands Radio Philharmonic Orchestra, Residentie Orchestra, Hamburg Symphony Orchestra, Oslo Philharmonic, Bergen Philharmonic Orchestra, and the Malmö Symphony Orchestra. Awarded the coveted ICMA 2016 “Young Artist of the Year”, and prizewinner at the XV International Tchaikovsky Competition, Pablo Ferrández is praised by his authenticity and hailed by the critics as “one of the top cellists” (Rémy Louis, Diapason Magazine). He has appeared as a soloist with the Mariinsky Orchestra, Vienna Symphony Orchestra, St. Petersburg Philharmonic, Stuttgart Philharmonic, Kremerata Baltica, Helsinki Philharmonic, Tapiola Sinfonietta, Spanish National Orchestra, RTVE Orchestra, Maggio Musicale Fiorentino, and collaborated with such artists as Zubin Mehta, Valery Gergiev, Yuri Temirkanov, Adam Fischer, Heinrich Schiff, Dennis Russell Davies, John Storgårds, Gidon Kremer, Ivry Gitlis and Anne-Sophie Mutter. his debut at the Berliner Philharmonie with the Deutsches Symphonie-Orchester Berlin, his collaboration with Christoph Eschenbach playing Schumann’s cello concerto with the HR-Sinfonieorchester and with the Spanish National Symphony, the return to Maggio Musicale Fiorentino under Zubin Mehta, recitals at the Mariinsky Theater and Schloss-Elmau, a European tour with Kremerata Baltica, appearances at the Verbier Festival, Jerusalem International Chamber Music Festival, Intonations Festival and Trans-Siberian Arts Festival, his debuts with Orchestra Sinfonica Nazionale RAI, Barcelona Symphony Orchestra, Munich Symphony, Estonian National Symphony, Taipei Symphony Orchestra, Queensland Symphony Orchestra, and the performance of Brahms' double concerto with Anne-Sophie Mutter and the London Philharmonic Orchestra. Mr. Ferrández plays the Stradivarius “Lord Aylesford” (1696) thanks to the Nippon Music Foundation. Elgin Symphony Orchestra Music Director, Andrew Grams, conducts a refreshing Beethoven & Haydn program. 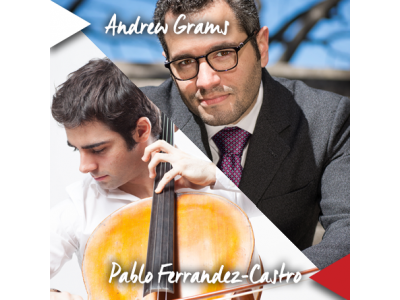 The concert features star cellist and finalist of the XV International Tchaikovsky Competition, Pablo Ferrández-Castro in Haydn’s Cello Concerto in C Major.